At The Table... With Doris Italian Market: It's Tuesday & it's still the Feast of St. Anthony? 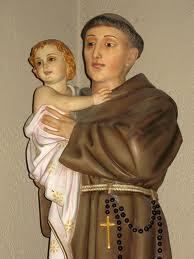 It's Tuesday & it's still the Feast of St. Anthony? Note: Because St. Anthony was buried on a Tuesday and many miracles accompanied his funeral, Tuesdays are special days of honoring him throughout the year. It is customary to pray a Novena to him on thirteen consecutive Tuesdays.